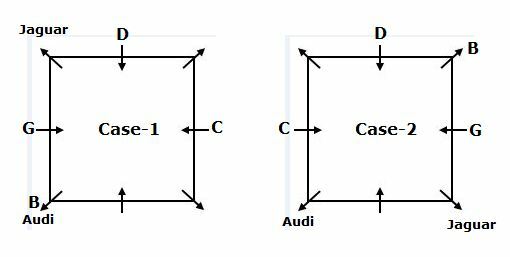 Eight persons A, B, C, D, E, F, G and H are sitting in a square table in such a way that four of them are sitting at four corners and four of them are sitting middle of the sides. The persons who are sitting at four corners are facing away from the centre and remaining are facing towards the centre. 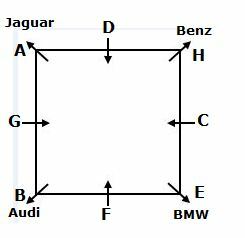 The persons who are sitting at corners only having different brand of cars viz., Audi, Jaguar, BMW and Benz. D sits third to the right of the one who has Audi. Only one person sits between D and C. B sits second to the left of the one who has Jaguar. B is not an immediate neighbour of C. G sits immediate right of B. Only two persons are sitting between F and the one who has Benz. E sits immediate right of F. E does not has Jaguar. As many persons sitting between B and D is same as between C and A. 1. Who among the following has BMW? D sits third to the right of the one who has Audi. Only one person sits between D and C.
B sits second to the left of the one who has Jaguar. B is not an immediate neighbour of C. G sits immediate right of B. Only two persons are sitting between F and the one who has Benz. E sits immediate right of F. E does not has Jaguar. As many persons sitting between B and D is same as between C and A. 2. How many persons are sitting between the one who has Jaguar and E? 5. If D is related to G and F is related to C in a certain way. Then H is related to which of the following? Six persons B, J, M, S, V and W are in different heights. V is taller than S,who is not third tallest. Only one person is shorter than W. Only two persons are in between S and M. B is shorter than both S and V. V is not the tallest person. The second tallest person is 175 cm height.More than one person is shorter than M.
6. Who among the following is the shortest person? 7. If S is 170 cm height, then what is the possible height of M? 8. How many persons are taller than V? 9. In a class of 53 students, Ram is ranked 25th from the top and Meena is ranked 38th from the last. Then how many students are ranked between Ram and Meena? Ram is ranked 25th from the top and Meena is 16th from the top. So, there are eight students ranked between them. 10. If there are 18 cars parked in a lane and facing north. The blue coloured car is 14th from the right end and there are 4 cars between the blue and red coloured car. Then how many cars are parked to the right of red coloured car? 1) Who among the following has BMW? 2) How many persons are sitting between the one who has Jaguar and E? 5) If D is related to G and F is related to C in a certain way. Then H is related to which of the following? 6) Who among the following is the shortest person? 7) If S is 170 cm height, then what is the possible height of M? 8) How many persons are taller than V? 9) In a class of 53 students, Ram is ranked 25th from the top and Meena is ranked 38th from the last. Then how many students are ranked between Ram and Meena? 10) If there are 18 cars parked in a lane and facing north. The blue coloured car is 14th from the right end and there are 4 cars between the blue and red coloured car. Then how many cars are parked to the right of red coloured car?